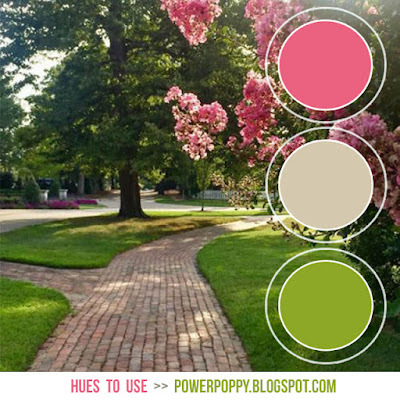 Power Poppy is back with another trio of colours to inspire you this week in our Hues to Use Challlenge. This week we introduce our first guest stamper too! 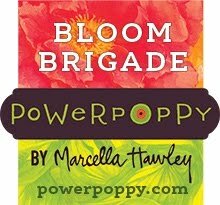 You’ll want to check out the Power Poppy blog for the introduction. I’m jumping in a day late with a pretty orchid design. 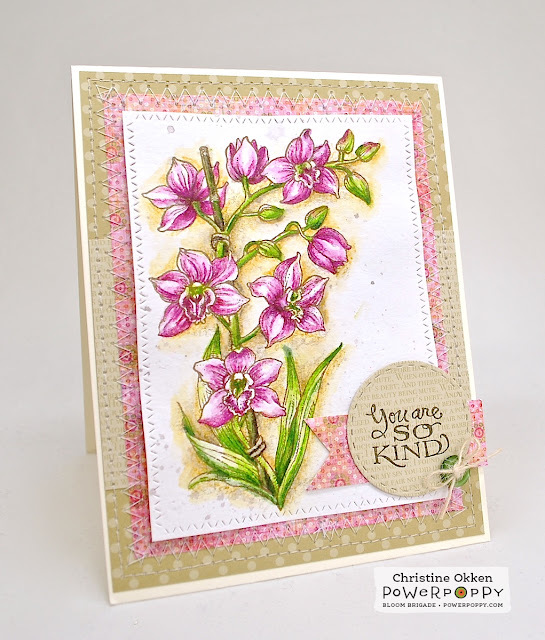 I used the lovely set Orchids Rock, stamping it in brown ink on watercolor paper. Next up, I pulled out my Inktense pencils and washed in some pretty pink colour onto the orchids, a bit of green on the leaves and some pretty buttery colour in the background. After it was dry I added some definition with my prismacolor pencils to pair better with the Hues to Use Challenge. Lovely colours together aren’t they? All from Marcy’s recent trip to the DC area. I flicked my waterbrush with some chocolate ink onto the watercolor paper and I sewed the layers together, adding some pretty pink designer paper to zing it up a bit. 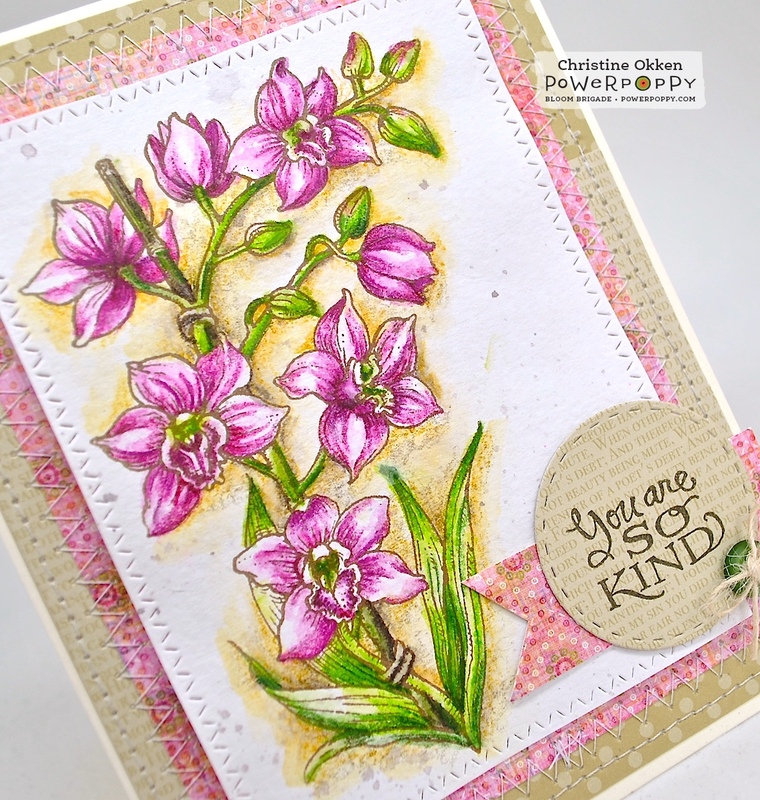 The sentiment is from Power Poppy’s Potted Primroses set. A tiny button and some twine accents the corner. So, come on over and play with this week's Hues to Use! If your creation is chosen, you get to join us in a future week of Hues to Use and win a free Power Poppy Digi stamp too! Lovely orchids, Christine. This card uses the colors for the challenge so well. Thanks for sharing it. Oh, Christine! This is GORGEOUS, and I so love your watercoloring! Beautiful colors to work with, and I love how you added more definition with pencils. I've found that so helpful. I love the layout with the DP and machine stitching, along with a great way to add your sentiment! Stunning card, my friend! Hugs! Christine, This is so pretty!! And using your inktense pencils is so clever and fun! I love what a light hand you have with these pretty colors! Beautiful! I love these colors and you used them to perfection. Your coloring with the Inktense pencils is gorgeous and inspiring! Wow, this is gorgeous Christine! I especially love your coloring around the image. I can never seem to get anything like that done without it looking like a total mess!